Campus helps you know when to follow up quotes that you've sent to your Contacts. In your Quotes Setup you will have told Campus how long to wait after you've created a quote before it gives you a heads up to go follow it up. 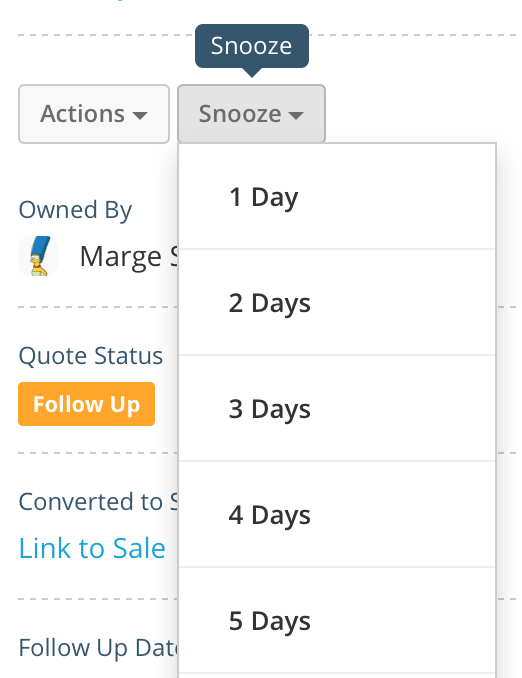 You can see how many quotes you have to follow up by clicking on the Quotes item in the main menu and then selecting the Follow Ups item in the filter menu. Snoozing a quote is a good thing to do if Campus is suggesting you follow up a quote but you feel it might be too soon. You just need to tell Campus to wait for a period of time by snoozing the quote and reminding you later. To do this click on the Snooze button, when viewing the quote, and select the period of time for which you'd like it snoozed. Choose one, or the Custom option, to specify your own snooze period.